Good morning to all my friends and fellow bloggers. Hope everything is well in your little world. It's time for another challenge at Get Creative Challenges The challenge is to use a diecut - must be one of the easiest challenges going because so many of us use diecuts in our projects. Please think about joining us for a chance to win three images of your choice from our sponsor Oddball Art. Papermania cardstock- to make 6" square card. I found it difficult to get a decent picture. The colours on the card are so pale and the sun is very bright - but I am not complaining about that!!!!! The last couple of days have been lovely if a bit chilly at times. Well, that's it for today. Take care. Gorgeous.....love those images & your colours are lovely. 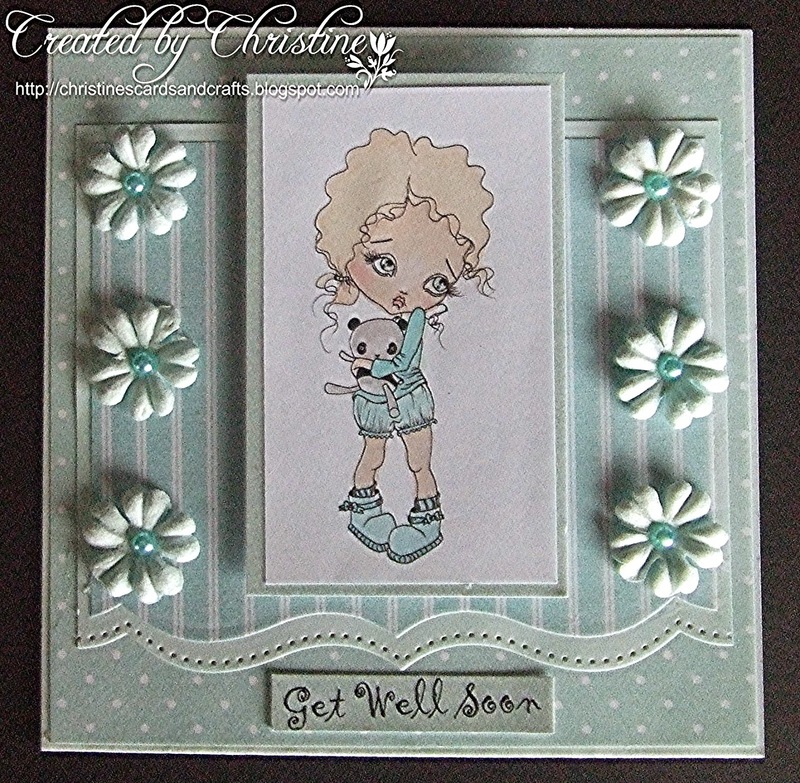 Gorgeous card Christine, such a sweet image and I love the delicate colours. Stunning card Christine, love the beautiful delicate colours, your image and fantastic design. Beautiful colour choice, and wonderful designing as usual. Those flowers look very interesting, and that image is just the cutest. Christine this is absolutely gorgeous. Such a beautiful colour. This is beautiful Christine, love the layout and use of die cuts, image is beautiful too. This is such a pretty card. Love these soft and delicate colours you used here. That border die is one of my faves! Fab card. Love the design and papers. Its been lovely here too but I think that's going to change tomorrow lol! You've made a very nice card Christine. Like the one below as well! My health is going to be a bit better, but still not okay. But I am in the mood for cardmaking again, so that's a good sign! Hope you're fine over there in 'good old England'! !